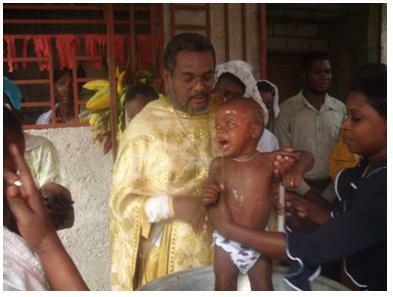 A baptism in Jacmel, October 2010. Miami - Every year, on Great & Holy Saturday, in the parish of Saint Moses the Ethiopian in Fontamara, Haiti, after the Matins service, the Orthodox Mission of the Russian Church Abroad has baptized children, youths, and adults from different parishes throughout Haiti who were ready to receive baptism. This year, thirty-eight catechumens were baptized into the Orthodox faith. Priests Jean Chenier-Dumais and Gregoire Legoute celebrated the Midnight Easter services in the Nativity of the Mother of God Church in the capital, Port-au-Prince, with many of the faithful taking part in the service. In addition, clerics and faithful of the Greek Orthodox Church joined the members of the mission parishes in this great celebration of the resurrection of our Lord and God and Savior, Jesus Christ. The feast of Pascha was celebrated with joy throughout our mission churches in Haiti. To support the Orthodox Mission in Haiti, please click here.